The pre and post-Les Exclusifs No 22 EDTs are fairly similar (no radical differences there,) but in the post-LE, the incense is much more pronounced. It almost smells like the Russian Orthodox church during the Easter mass--white flowers and incense. In general, as I compare my 10 samples of No 22 produced over the past five decades, the incense note has been getting more and more pronounced, as Chanel began to tone down the aldehydic top bit by bit. Still beautiful! I haven't sniffed 22 in years, but I always liked it better than 5. Not that 5 isn't gorgeous, but I could never personally deal with the powdery bit. @@ I'll have to revisit. Yours is the most exquisite, poignant review of this Chanel classic - No. 22 - that I've read. My mother recived a bottle of Chanel No. 22 -perfume extrait from my beloved father on their wedding day : June 1st 1947. 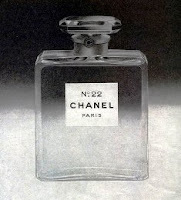 Chanel No.22 has always held a special place in my heart . have tried to honor that special moment in time by presewnting our mother (now 80 ) with Chanel N0.22 -albeit a EDT spray and body lotion. It simp;y isn't the same . I sowish that the 22 perfume was more readily available . How hard is it dear C, to have it shipped from France to the US ? Thank you ,once again for bringing to life such a precious remninder of Chanel's collection. I can envision it's softscrnt illuminating the room..
utterly beautiful - devastating feninine in a nelancholy way. In an article about designer fragrances from Vogue 1925... No 22 is presented among other number fragrances of Chanel, now completly forgotten. So, the story about 1928 is totally false. In the same time, the story about chosing a number (5 and 22) from 2 series is not totally true because almost all those numbers were put on the market by Chanel. But the most succesful were 22 and 5. Beautiful review! I'm so psyched about this week being devoted to aldehydes! I adore #22, but it took me a long, long time to appreciate it - had to have my white floral conversion first since I actually, and most unfairly, am in the group who get very little incense. However, after reading Victoria's comment I'm wondering if it's because I only have ever tried the vintage parfum (from what I was told, it's from the early 50s). I'm going to have to try a newer version and maybe even an edt to see if I get more incense - which I would love. Great review! In contrast to Elle, I get mostly aldehydes and a reasonable of incense, which is totally worth the wait through my least favorite part (those white florals). Having read V's note up there, I should try the new one. I've been creeping up very carefully to aldehydes, which I've started "doing" in discret touches through Bois des Iles and Cuir de Russie, then a bit more boldly with Divine's L'Ame Soeur... N°22 has been on my "to try" list for weeks but I always get sidetracked by the other exclusives. Your review will help me push the spray button. And then I'll just to add to that ever-growing Exclusives list (4, no, 5 so far). Where is my Arabian prince (a variation on the theme of the oligarch)? Coffee deprivation... "I'll just have to add", of course. And "discreet" with two "e"s.
Thank you so much for the information! Easter mass! OK, I have to try the new 22! I think on me there is a similar amount of powder in 5 and 22, which is to say- quite a bit, but not too much for me. It is just that I find No 5 to be a "cold" scent, while No 22 has warmth and life...I do like No 5 too, just not as much. Thank you very much for your kind words! I don't know if you ever deal with eBay, but I do sometimes see No 22 parfum there, sometimes from American sellers, so no international shipping would have to be involved. Having said that I haven't had problem shipping perfume from overseas either. Also, hasn't it been said that parfum concentration of No 22, Bois des Iles and Cuir de Russie was not discontinued? Somebody correct me if I am wrong. I must try vintage Quelques Fleurs now. We both have to try the new No 22...even more incense! That would be wonderful. I'd say it is in equal proportions- aldehydes-flowers-incense on me. I am very curious to try the version with an even stronger incense note. I think you will totally love it! Seriously though, No 22 is a beauty and I would love hear about your impressions of it. I knw alll about cofee deprivation. Simply can't get this out of my mind this morning. Do you know if they sell the new one in a smaller size than that whopper 200 ml? Oh, but I love that vintage ad you used! 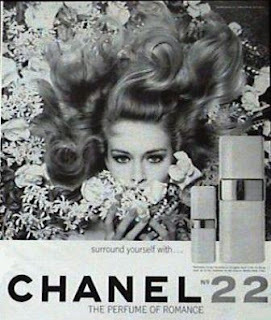 I *love* old Chanel ads...I am this close on starting collecting them...No, no, no, must resist the urge to fall into the abyss of a new obsession! I don't know what it smelled like before, or I've forgotten,but the Les Exclusifs version is just stunning and was one of the best discoveries of the whole Les Exclusifs release of a scent I had ignored. Wonderful! Great to know that for once a reissue did no evil to a perfume. The four rue Cambon extraits are *not*, repeat *not* discontinued. Here, aren't we all breathing better? I agree with the pre-LE 22 as being more full-bodied and earthier. Although I could not wear either 22 or 5 in the universe we currently reside in, I think that I would choose 22 over 5 anytime. I don't get the incense note on this one- at all. Mostly a splash of aldehydes with flowers blossoming- even the floral dry-down is pretty faint. I love this one! Thanks for the terrific review. No. 22 is so unlike other scents I like, but I really adore it. That was an amazing review - I kept saying "yes! yes!" with every new sentence. That was as much of a pleasure to read as the scent itself. My grandmother wore only no. 5 because she said it was the only thing that didn't 'turn' on her - I find I have the same problem, but 5 reminds me of her. I have a deep religious belief in 19 and 22. Thank you for seeing what I smell in 22, and communicating it so beautifully. I've been wearing No. 22, since I was 18 or so... about 35 years... I have 2 bottles left of the "old" stuff. The fragrance has changed somewhat and in the end the only "type" that was close to the old one was "Eau de toilette". I came on-line to see if I could still purchase it, as Chanel has been threatening to pull the fragrance for years and I didn't exactly believe it this last time either (darn it)... anyway, it's now awfully pricey... my other long time favorite (but, was pricey any number of years ago) is Bellodgia by Caron... since, Chanel 22 seems to be out of my sanity price range for now... guess I am off to see if I can rediscover Bellodgia. P.S.... I never liked No. 5, I originally found No. 22 unused on my grandmother's dresser, right nest to her well-used No. 5. I have been trying to find #22 as a gift for my 84 yr. young mother. I can't find it anywhere. Some places are "out of stock". I checked Bergdorf today (9/13/08), but it's not even listed in their stock. Any help would be greatly appreciated. THANK YOU !! A huge THANK YOU to Marina who helped me to find Chanel #22. Chanel Boutique in NY (212)-355-5050. Smile on my Mom's face- PRICELESS !! I have used only 22 for at least 40 years. I was urged to try it when in the Bahamas and have never changed, even tho I cannot smell... others can. I have Parkinson's and loss of smell is an early hint of it. I am abouut out of it and cannot find it in the small town I am in. I asked for Chanel no22 while in a Chanel boutique in Paris and was told that its only made for USA export at that time (2000)and not available in France.I have been back several times and the answer then was that it was discontinued. I wish they would bring it back! Where to buy chi hair straighteners ? suerflatiron will help you to find the best chi flat iron and chi nano ceramic flat iron. Ghd hair straighteners. I have a number of Original Chanel 22 products on Ebay. These are very rare and hard to come by. These products are new and belonged to my late mother who used to stockpile these on shopping trips to Macys in New York.